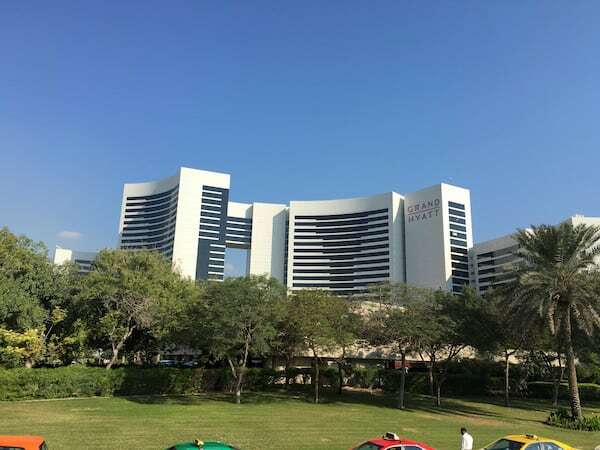 The Park Hyatt Dubai is located about 10 minutes from the airport along Dubai Creek in the area known as Deira. It is removed from downtown Dubai which is a good thing in my opinion. 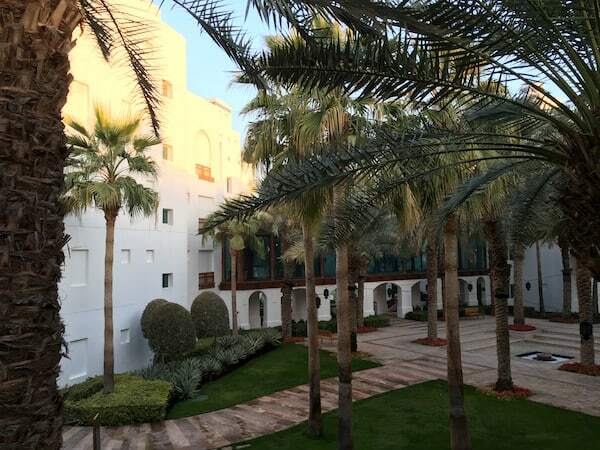 The hotel property is boarded by the creek, marina and golf course, so you feel like you are in a peaceful resort. 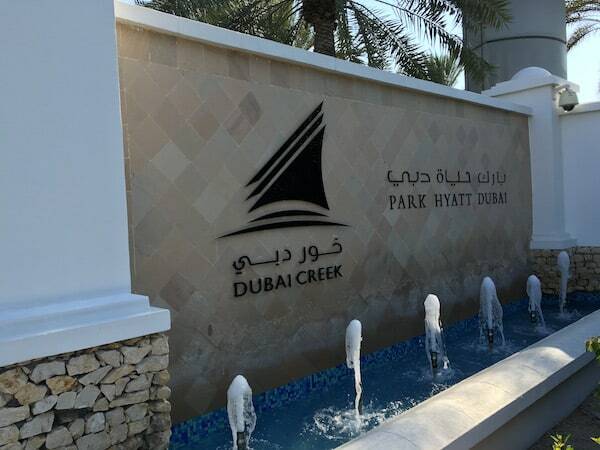 There are (currently) six Hyatt properties in Dubai (three at the creek — well saturated). 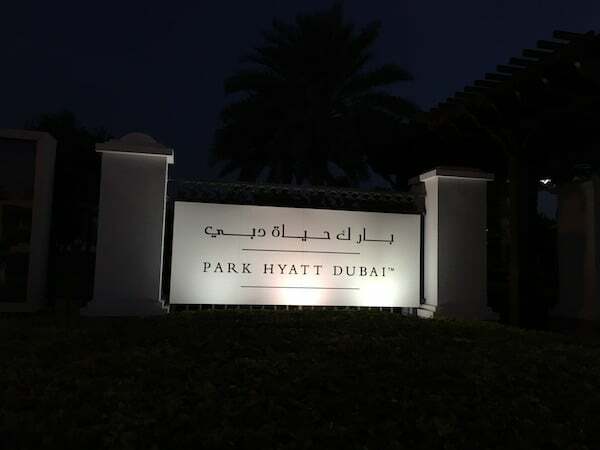 Driving by the other properties (except the Hyatt Place properties) I feel staying at the Park Hyatt Dubai was absolutely the best choice. 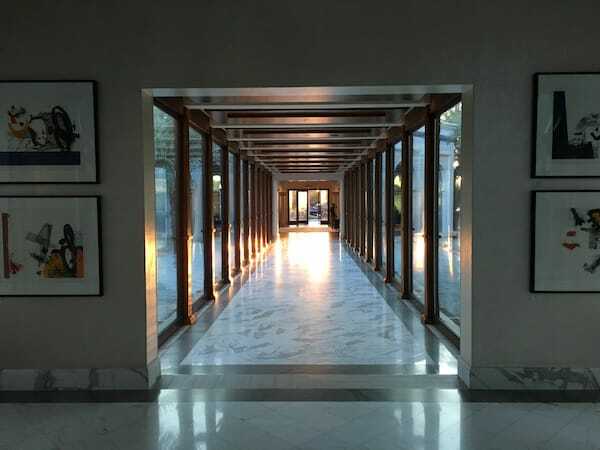 The Park Hyatt Dubai property is four buildings all connected by passageways (this is Dubai, you can’t go outside in the summer). 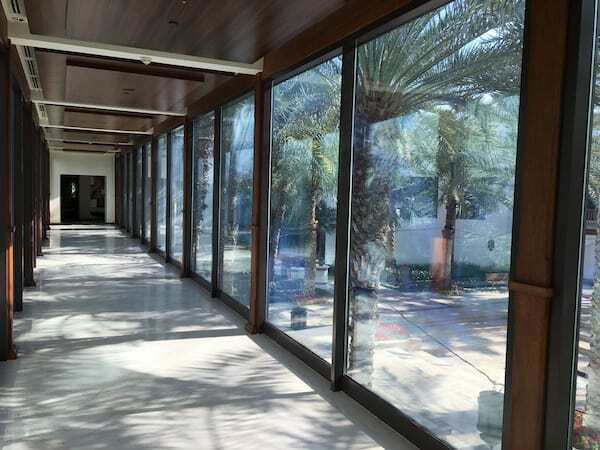 The property has a total of 225 rooms. 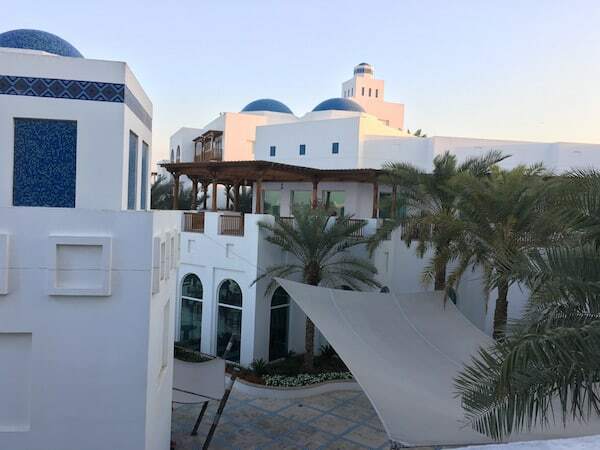 Each building is four to five stories and built in what I would consider a Middle East or North Africa style; white stucco with blue domes on top. 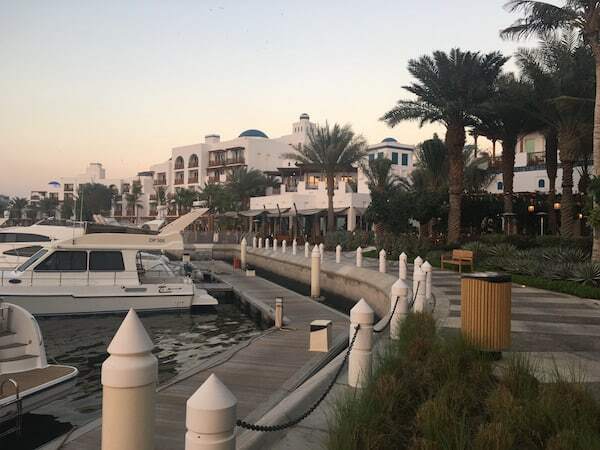 The architecture is striking against the green vegetation, white boats in the marina, and reflection of the river. 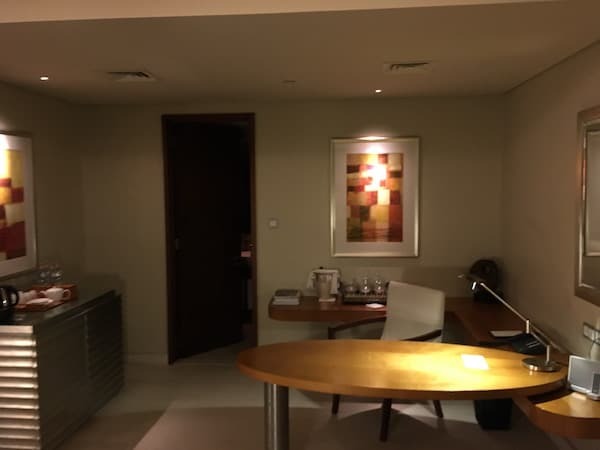 I booked my room with Points + Cash (10,000 points and $125 cash — $150 after taxes). I then used a Diamond Suite Upgrade to secure a Park Suite. 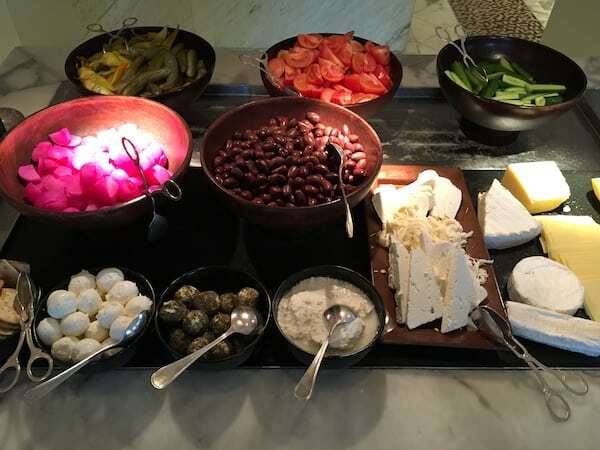 Breakfast for Diamond members was in Cafe Arabesque and consisted of a buffet with hot dishes to order (if you could get the server to take your order, more on that later). 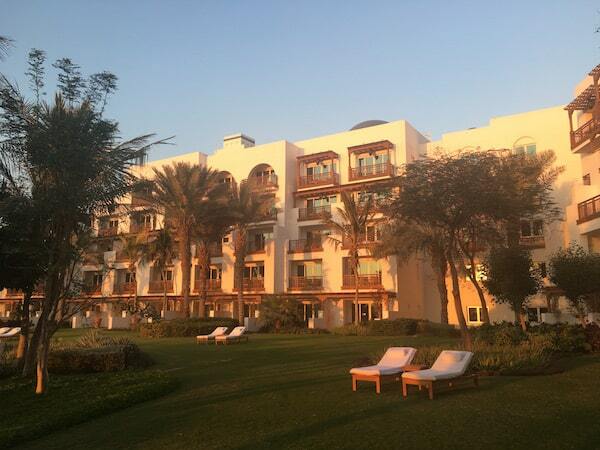 Check In: I arrived later after my Emirates flight from LAX. It is a short taxi ride from the airport; although there seems to be traffic at all times in Dubai. Shouldn’t take more than about 15 minutes from the airport however. You enter the property through a guard gate and it is maybe a half mile to the property. The taxi can take you all the way to the front door. 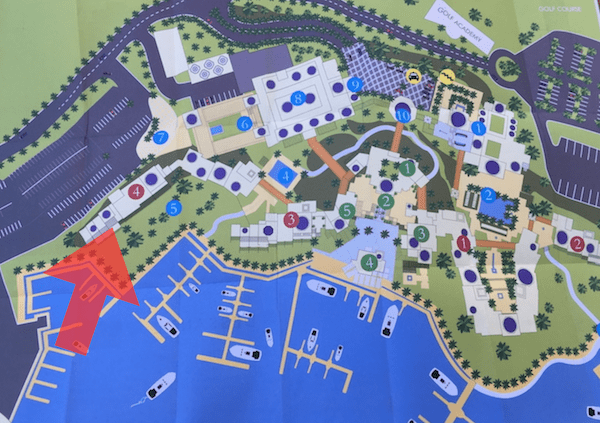 However, if you are coming in some other way (say via bus or metro), you can have the guard call a golf cart to come pick you up or you can walk it. 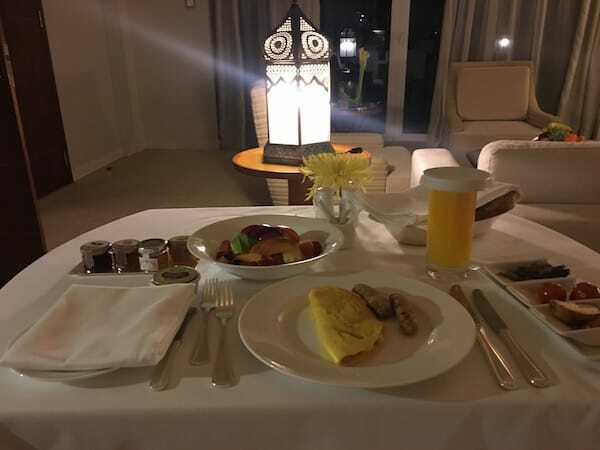 There was no line at check in and I was quickly escorted to my room where the staff showed me all that I would need to know about the facilities. 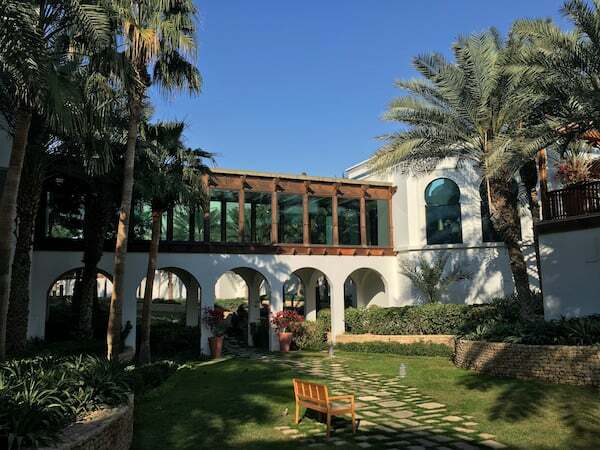 The Room: The Park Suite was located in building four (the farthest from the lobby) on the third floor (the main floor actually — the lobby and breakfast are also on floor three). It was a bit of a maze of corridors to get to my room but once I had walked it a few times it was pretty simple. The room was very spacious. 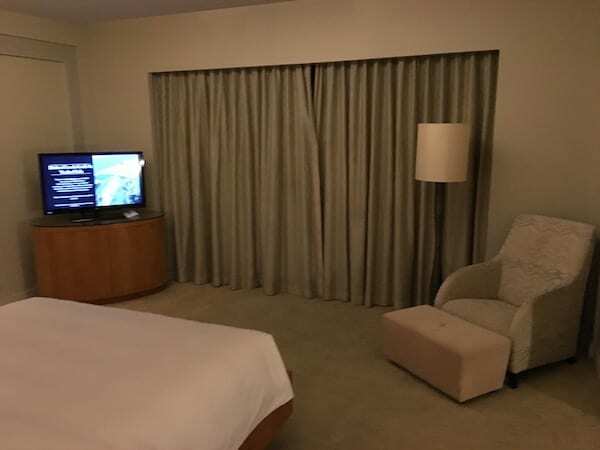 The door opens into the living room that has a nice large seating area with tv, work station and mini bar (which, confirmed, is free if you are in a suite!) 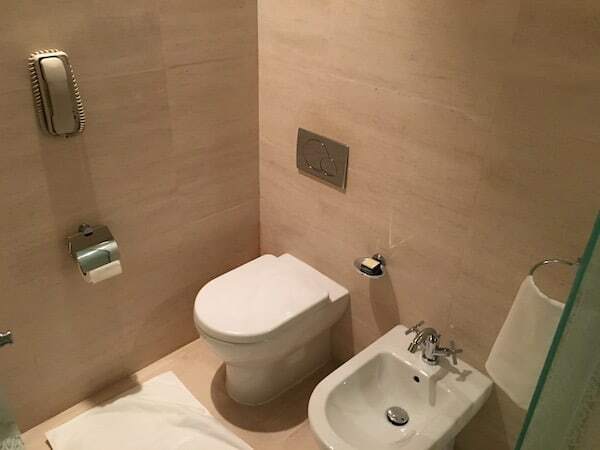 There is also a powder room off the living room (toilet, bidet and sink) as well as a balcony with breakfast table. 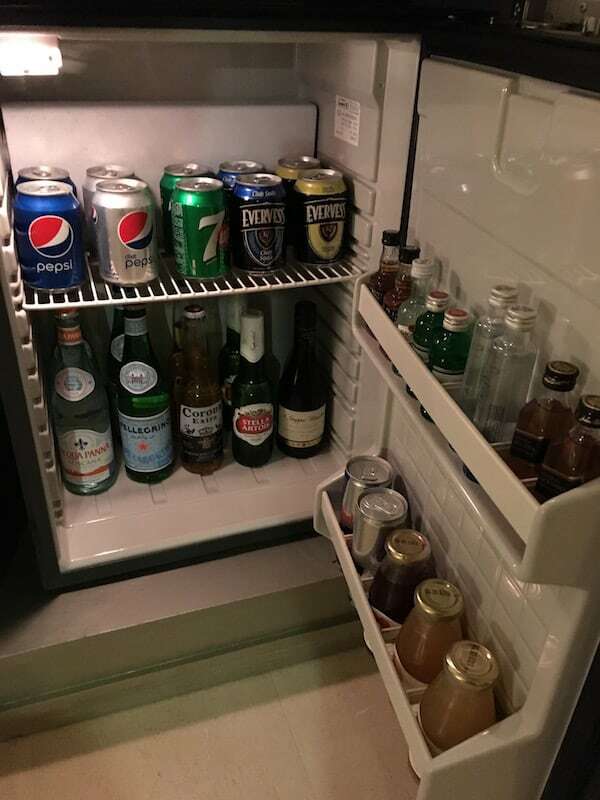 And the all inclusive mini bar plus snacks. Large double doors lead into the bedroom (single king bed). The bedroom also has a balcony with two lounge chairs and overlooks the creek. 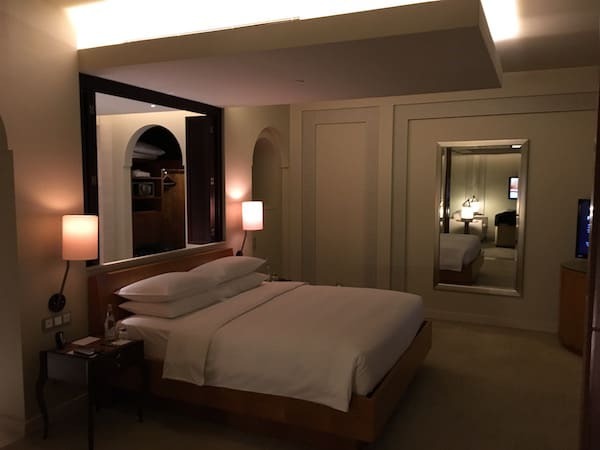 Like many Park Hyatt properties, the Park Hyatt Dubai rooms are very modern, very sleek and minimalist. 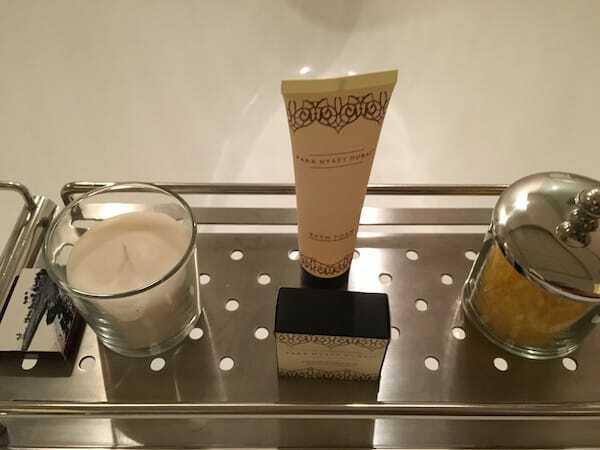 However they still manage to incorporate some arabic touches like the lantern lights and tile in the bathroom. I believe all rooms have a view of the creek (and the city beyond). 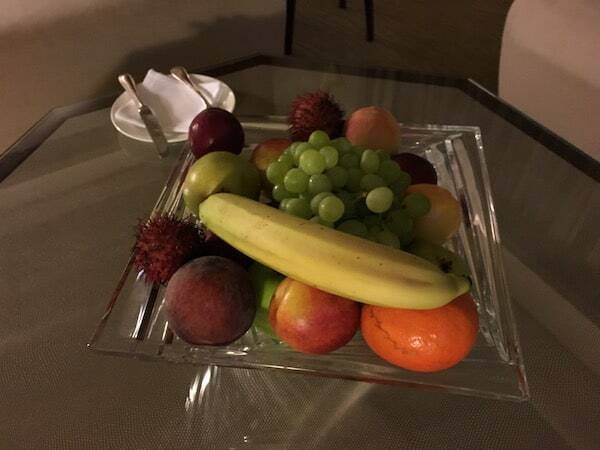 Water and fruit was refreshed each day (twice a day I believe, at least with water). 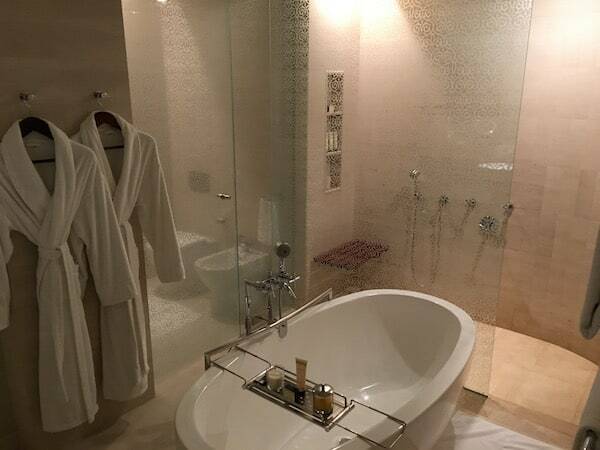 Bathroom: The on suite bathroom is very large and opens up directly to the bedroom. It is possible to close it off slightly but there is no door. Hope you are comfortable with your company. 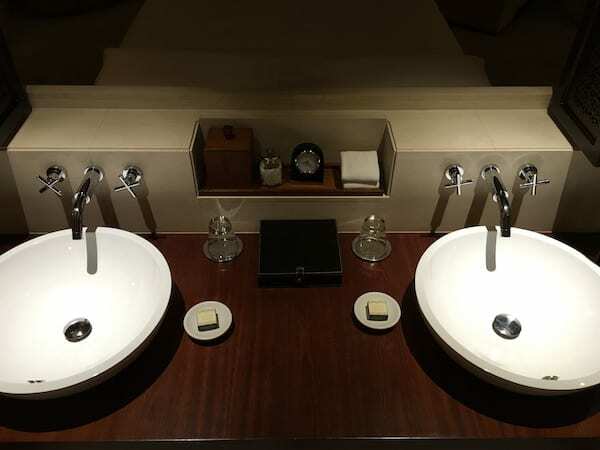 The double vanity is separated from the head of the bed with a half wall (really a window cut out I suppose). A dressing nook is one side and a closet on the other. 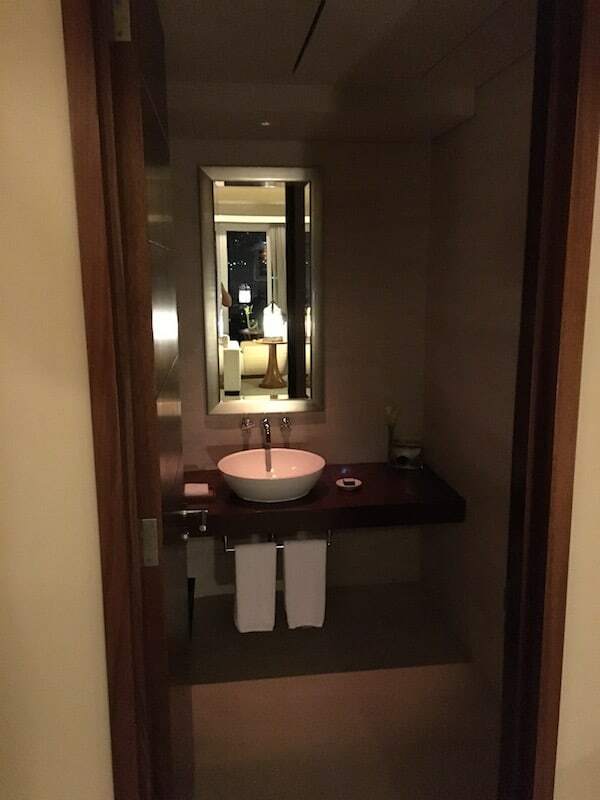 The bathtub is literally in the center of the bathroom. Separate large walk in shower with rain shower head and wand is against the back wall. I found the shower got very hot so I had to leave the glass door open. 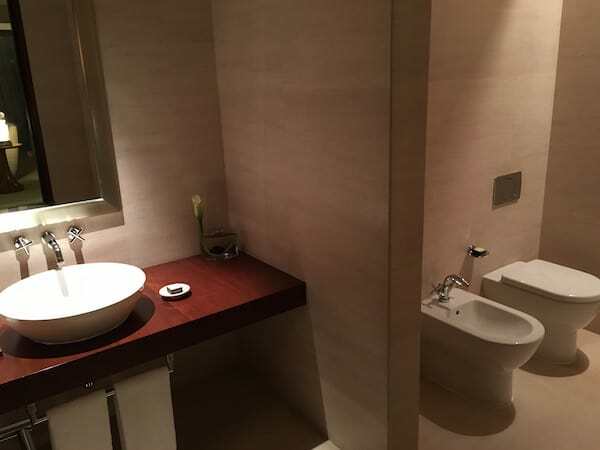 The toilet and bidet are also enclosed by a glass door. 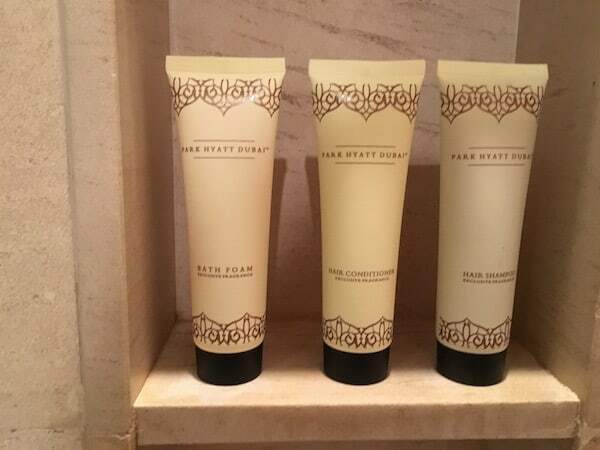 The bath products all seem high quality (and large quantity). 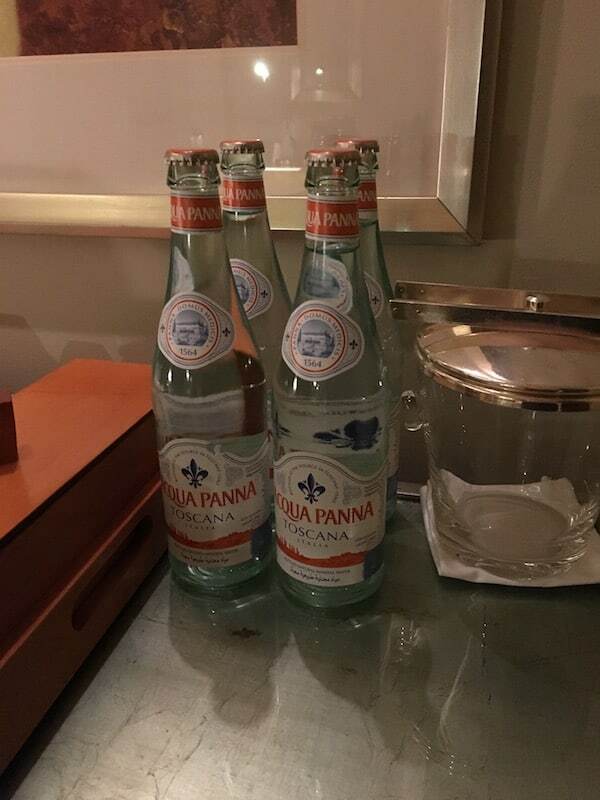 I think each bottle was 3.5 ounces. There was even a large candle at the tub that, interestingly, was from Ikea. Pool: The pool is located between buildings one and two; so quite a walk from my room. 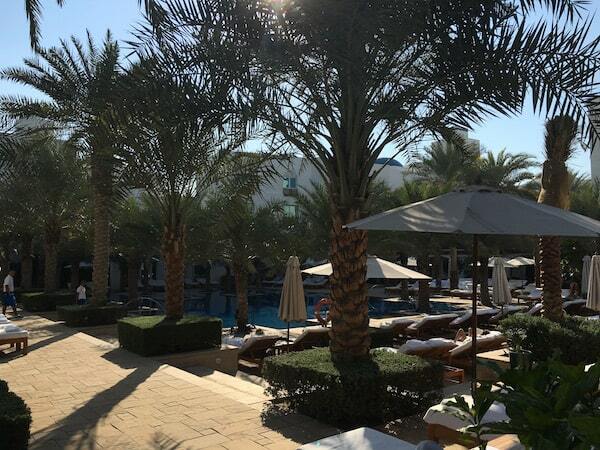 It is a large, palm tree lined pool with plenty of shade and chairs. 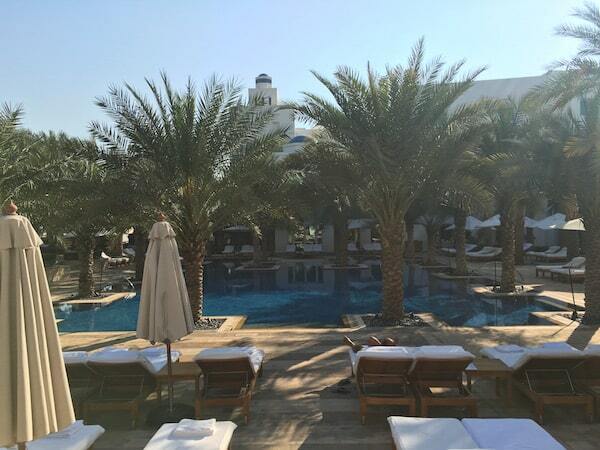 As this is Dubai, there is no hot tub but the pool has jets in certain corners if you want to relax. There is bar and cafe off the pool area as well. 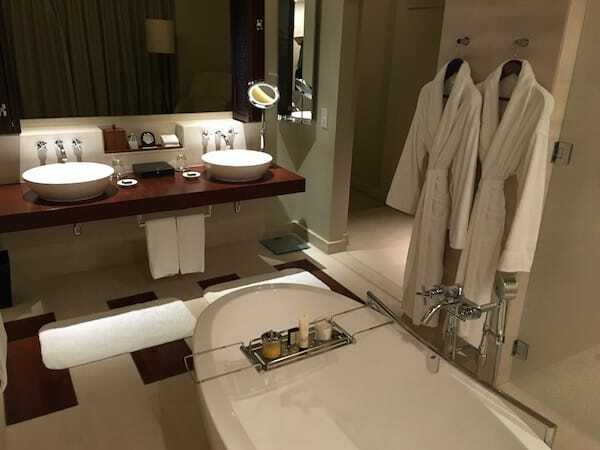 Spa: For the sake of thoroughness, I of course had to book a massage. The spa area is quite nice. There are locker rooms with steam room and sauna that guests can use even without a treatment. The treatment rooms all have an outside (walled off) portion with a shower that I found very relaxing. 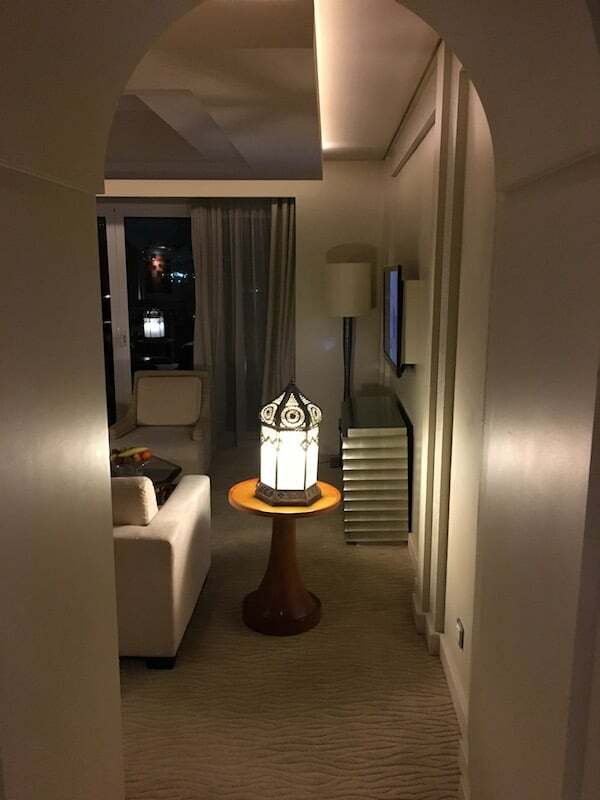 Service: Here is where I felt like the Park Hyatt Dubai could be improved. 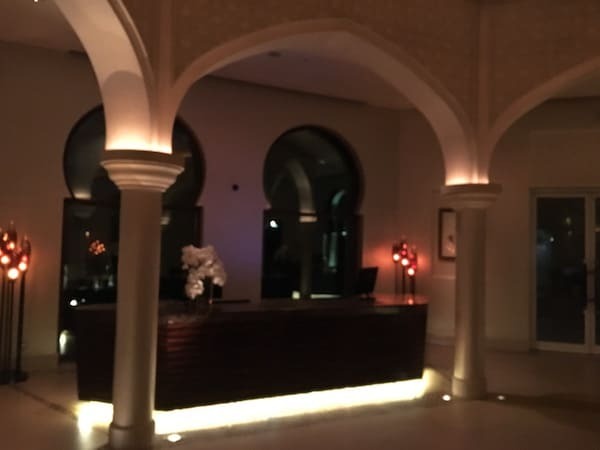 The front desk staff and concierge were very friendly and helpful (and from all over the world; like everyone in Dubai). 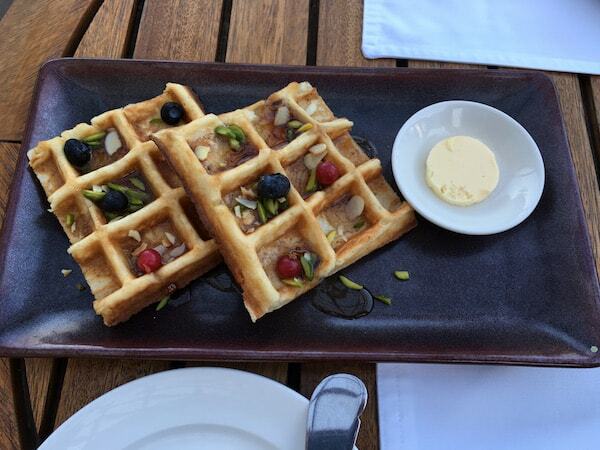 However, I found the service during breakfast at the Cafe Arabesque to be terrible. 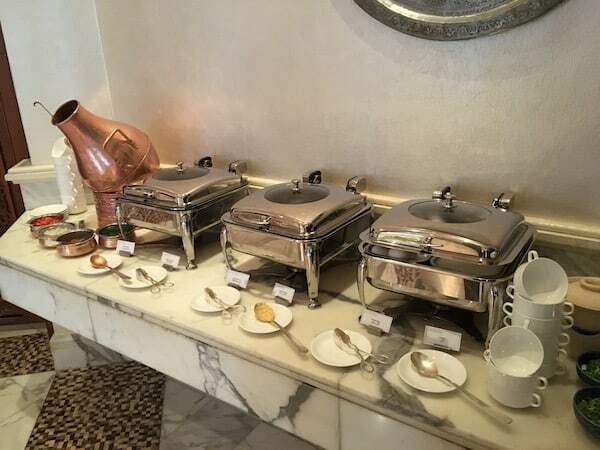 The first day at breakfast the waiter had only me and another table and was hovering the entire time which made me feel a bit uncomfortable; every bite being watched. However, the next day I had the exact opposite problem; never once did a server come to my table. 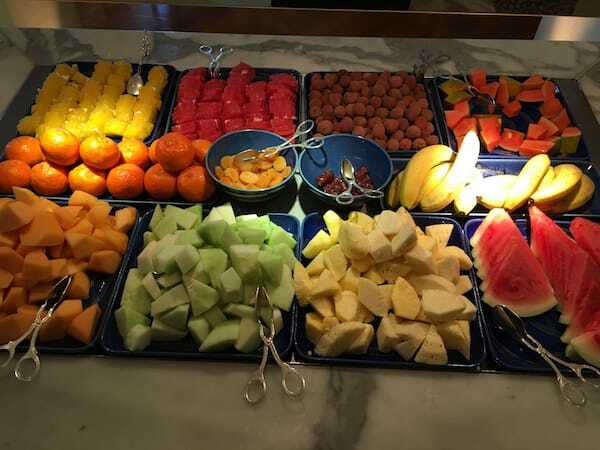 In fact, I ordered some fruit (strawberries, that didn’t have them out) and was told it would be brought out to me; which it never was. 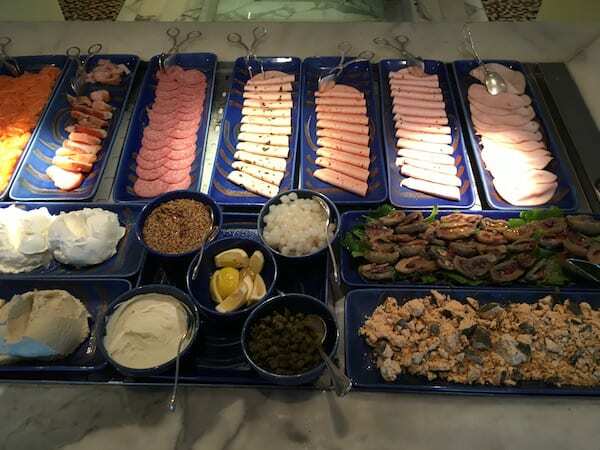 With that said, the food at the breakfast buffet was very good. 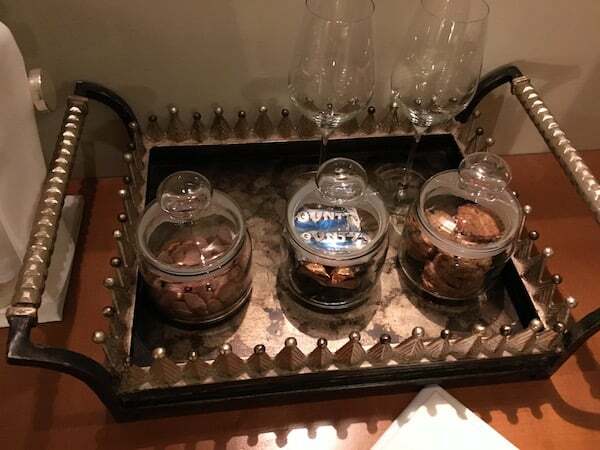 As a Diamond I had the options of ordering off the menu (hot items) and picking from the buffet. 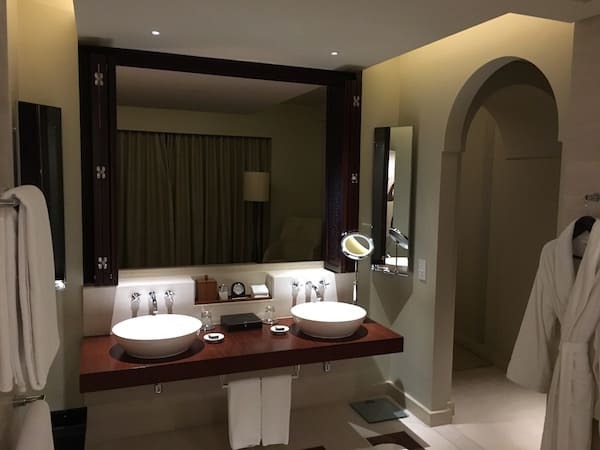 The housekeeping staff were all friendly and did an amazing job of keeping the rooms spotless. 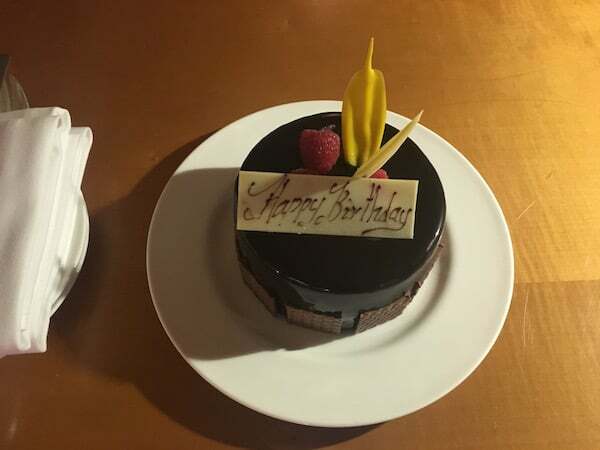 The last night I was brought a birthday cake which was very nice. For breakfast my last morning I had room service as my flight was early and I had to leave before the buffet opened; which was included for me as a Diamond member. 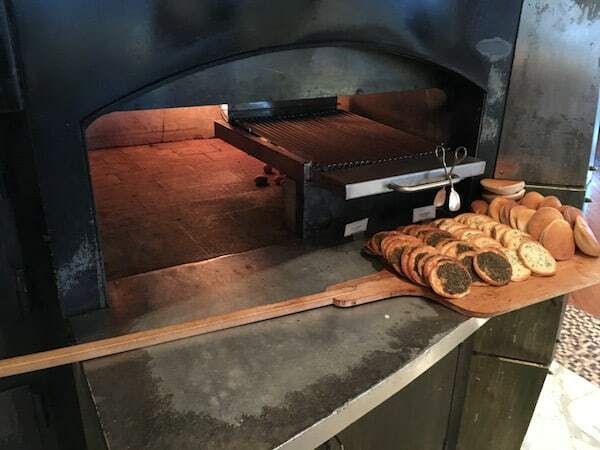 There are other restaurants on property but I never tried them out. Be aware most don’t open until 7:00pm. 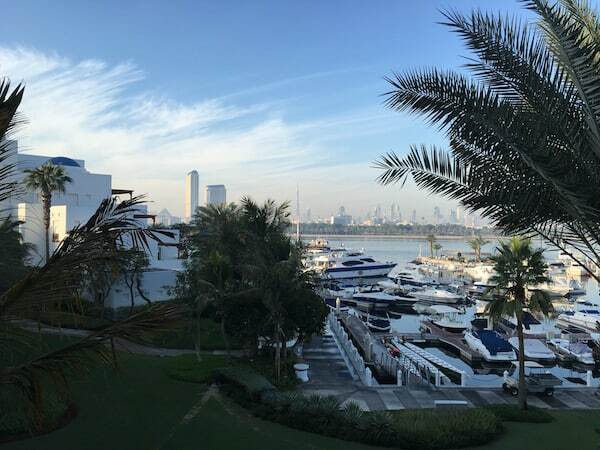 Overall: I can’t imagine that the other Hyatt properties in Dubai could be better than the Park Hyatt Dubai in the area of hard product. The room was beautiful and large (granted it was a suite). The grounds were immaculately landscaped. The location being a bit out of town was a benefit to me; but it is removed. There is a mall across the street but it is a bit of a walk. The service (at least at breakfast) could be greatly improved. 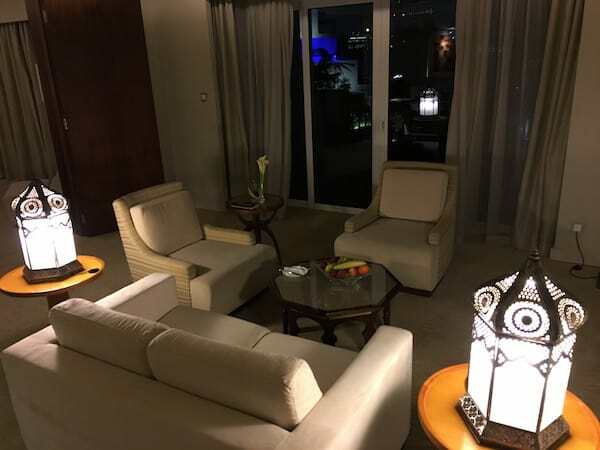 However, I would have no reservation about recommending to anyone visiting Dubai; especially if you are a Hyatt Diamond member and can use a Diamond Suite Upgrade.